Now children have their own blank 3D mug design that is easier than the grown-up's version. It has a chunky spoon, basic packets and a tray too. 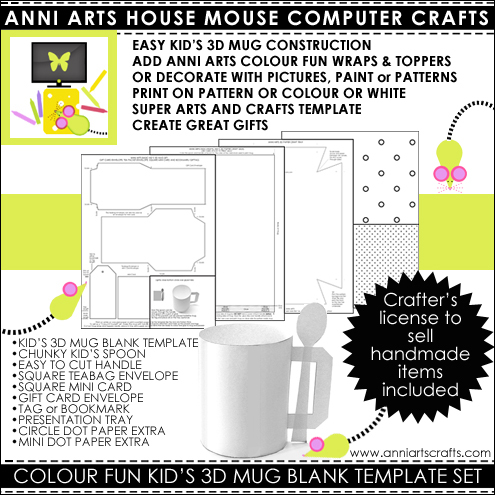 It can be decorated with the Anni Arts mug wraps and toppers or in any other way! Print the blank templates again and again- a once off purchase! • The tag can be bookmark length or trimmed to tag length. The blank template set only needs to be purchased once. Print over and over again. Add decorations, wrappers and toppers as you please. Download and start. Print as many as you need. Frugal fun for kid's arts and crafts. This versatile mug design can be made easily by older children (small ones will still need help, but Mom or teachers will appreciate the easy method). handle and card are easy to cut. It is not as strong as the regular Anni Arts mug so do put it in the presentation tray if heavier items than the tea and gift card packets are placed in the mug. Print on any card stock. only - depending on papers used. NOTE: The mug set has to be physically printed so that the Anni Arts imprint is always visible. You are not allowed to extract the templates to use as trace-off templates. TIP: You can print the optional big or small dots on the inside of the mug and over the packets for a texture that goes nicely with BW line drawings for coloring. The mini dots actually go with everything. The larger dots can even be colored in. You can print any pattern on the front or back of the mug and tray (like the Anni Arts Geo Pattern Prints or other background papers) so that the pattern is either on the inside or outside of the items. What wraps and toppers would you like to see? Scroll down to comment ! • You need a printer to print the pages. Set quality to "best"